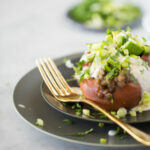 This is one of my favorite recipes ever, healthy Mexican loaded sweet potatoes. Do you like sweet potatoes? I think nobody will argue with me that sweet potatoes are an amazing powerhouse of nutrients. Each bite we take fills us with vitamins, minerals and super good stuff for our body. And, they taste amazing as well! They are good with almost anything you serve them with, but probably this recipe is my favorite. Well, not probably, this is one of my favorite recipes ever. 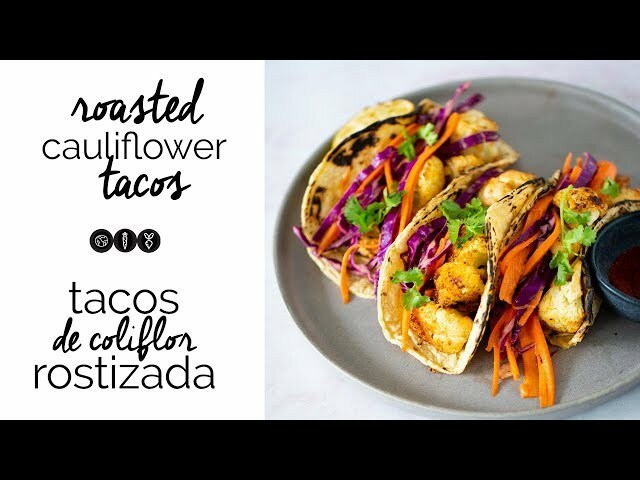 It is so easy to prepare and it is filled with Mexican flavors. 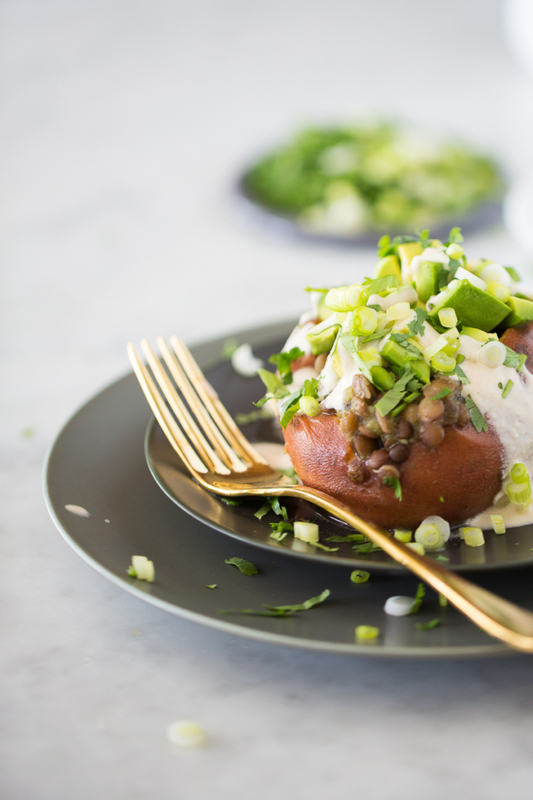 This loaded sweet potato is filled with yummy and healthy lentils with salsa verde, avocado, cashew cream, scallions and tons of cilantro. Don’t you just love how they look and sound? 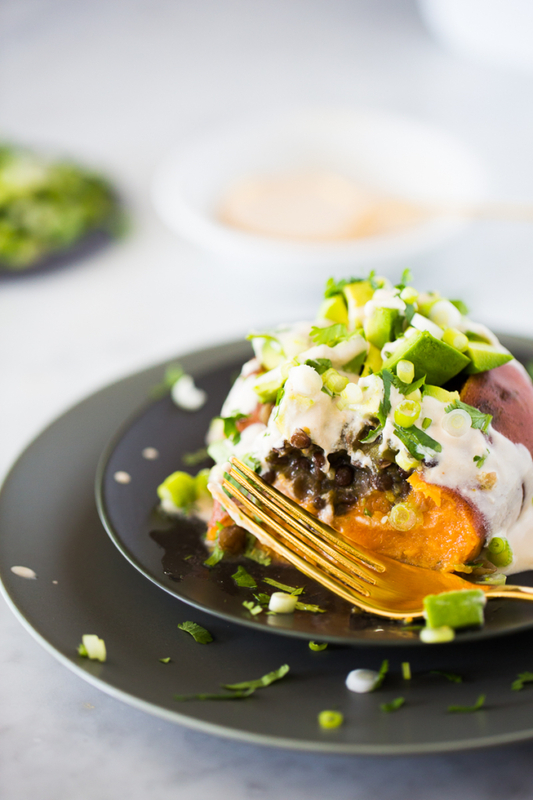 Also, this recipe for healthy loaded Sweet potato is perfect if you do the batch cooking or if you prepare your weekday dinners ahead of time. 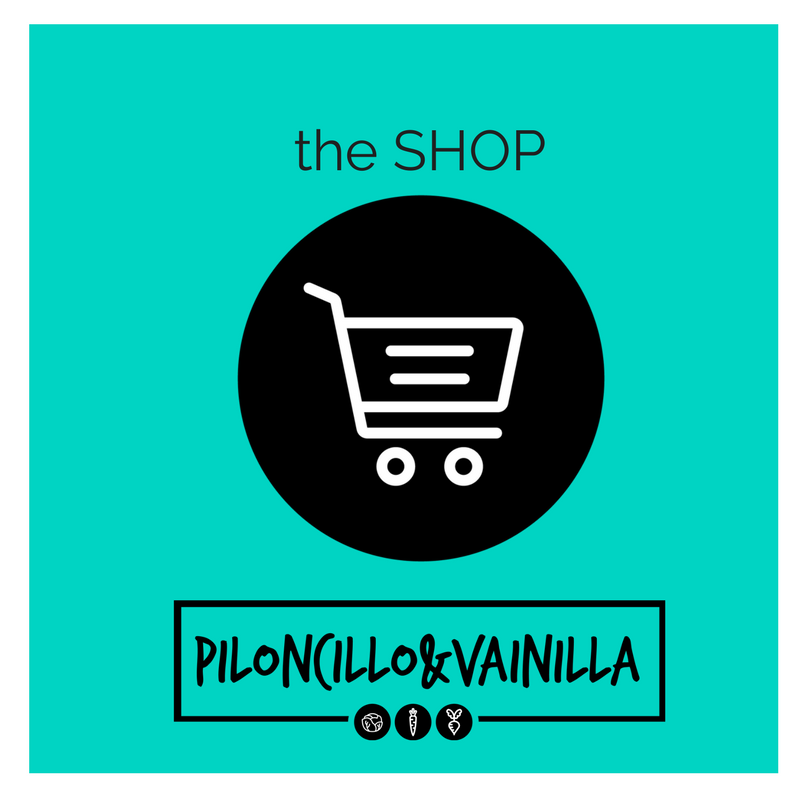 You can have everything cooked and prepared in the fridge… and when dinner time comes… VOILA! A delicious authentic Mexican and healthy loaded sweet potato. 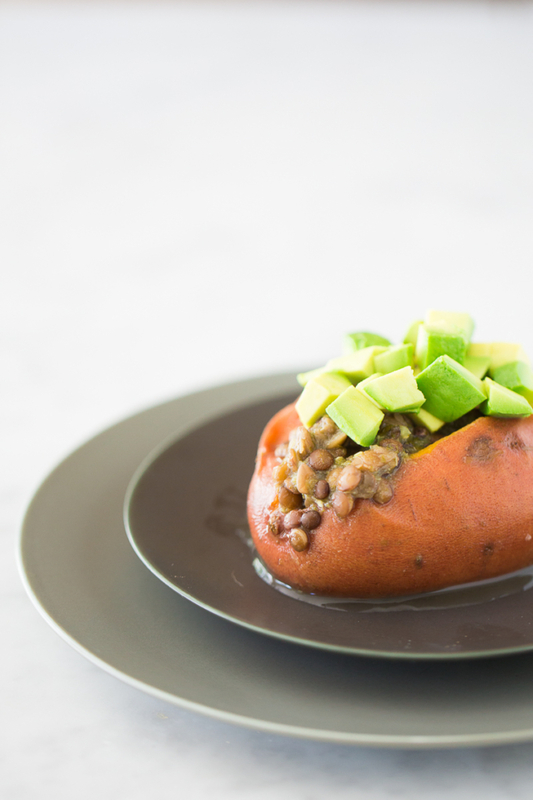 this healthy Mexican loaded sweet potatoes with lentils in salsa verde. Hope you like them, and if you do, please share the recipe and the blog. 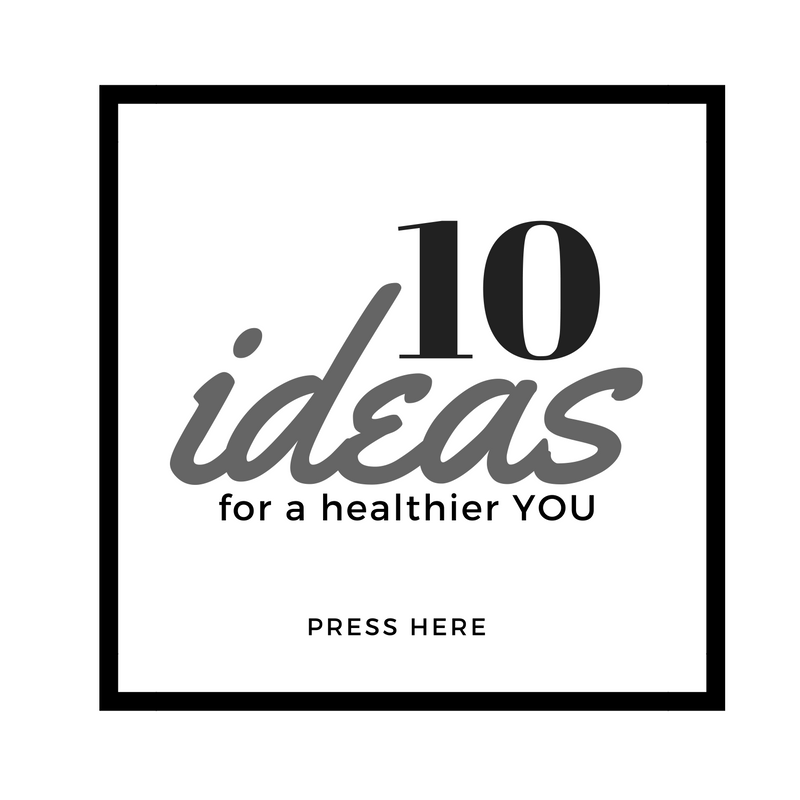 If you make it take a picture of it and post it on Instagram or Pinterest. Don’t forget to rate this recipe if you give it a 5-star review would be FANTASTIC. Healthy Mexican loaded sweet potatoes with lentils in salsa verde with avocado, cashew cream, avocado slices, and scallions. 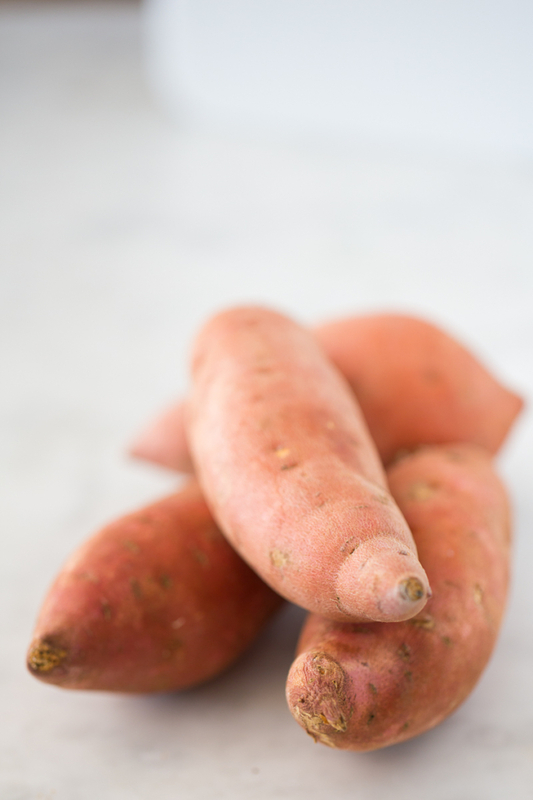 Boil sweet potatoes in enough water to cover them with a teaspoon of salt.Leave for 20 minutes or until they offer no resistance when pinched with a fork. Leave aside when ready. 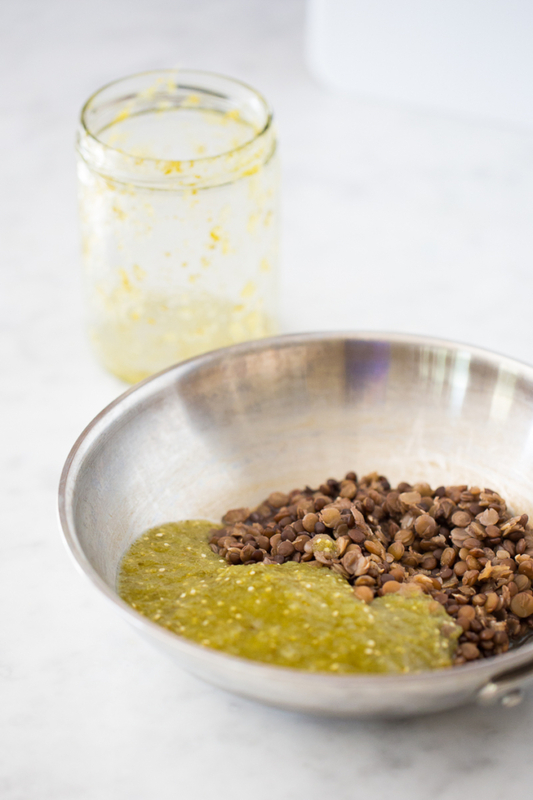 In a small skillet heat the green sauce with green lentils. 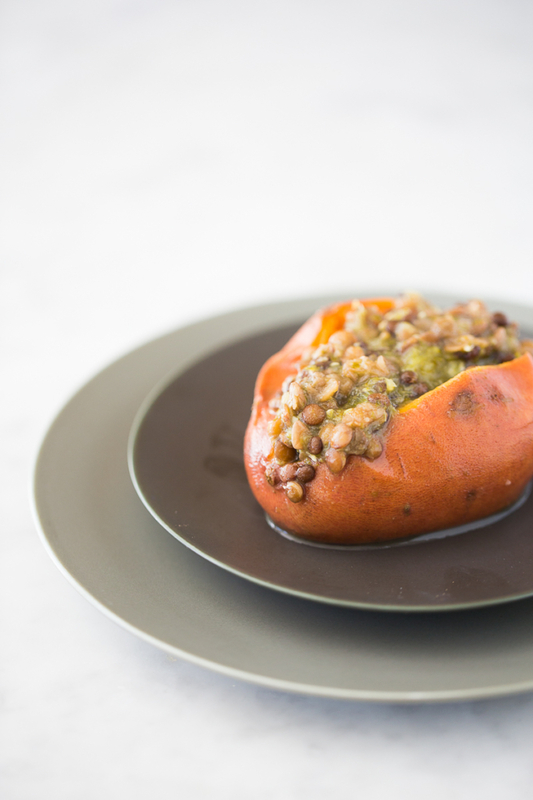 When ready to serve, make a small incision at the center of each sweet potato and stuff with two tablespoons of lentils in salsa verde. Top with the diced avocado, drizzle a teaspoon of vegan sour cream and finish with minced cilantro, and scallions. The salsa verde recipe you can find it here. This recipe is a republished recipe from September 2016. What a great idea for using lentils in a different way. This is genious mi Ale! I love every ingredient in this recipe. And you master the art of combining them! I could eat sweet potatoes for every meal. This looks like an amazing combination!